How do you get promoted into a management role? Many ways exist, but most often, you are promoted into a management role because you are good at doing the job. That makes sense—you don’t want an employee with experience as a marketer promoted to a position as a manager over your research scientists. It’s hard to manage people when you have no idea what their tasks are. But, a big problem occurs when you promote your best “doer.” The problem is that doing is not at all like managing. Managing requires a set of soft skills in addition to the doing skills. Soft skills are the most significant skills a manager needs to have. This may seem shocking as you want your best engineer to become the engineering manager and the best marketer to become your marketing manager, right? Probably not. How is this promotion best using their skills? Here’s why you need to consider soft skills when hiring and promoting employees to management positions. If you just had a team of robots, you’d need no people skills, but until that day, every manager needs to know how to work with varied individuals. People have good days, bad days, and just normal days. Employees get in fights with each other, bully each other, and occasionally steal lunches from the kitchen. Who gets to deal with that? The manager, of course. Now, some people would suggest that you should direct those problems to the Human Resources department, but HR isn’t set up to manage every problem that comes up. They can’t do it. Much of the job of a manager needs to happen at the moment when the problem occurs. You can’t wait until you can secure an appointment with the Employee Relations manager to correct an employee’s rude statement in a meeting. Indeed's Director of Recruiting, Mike Steinerd, identified these as the top soft skills companies seek. Every single one of these soft skills is critical to management success. What do you do when one of your employees comes down with a stomach bug on the day of a big client presentation? You can’t make that person come to work anyway—that is disastrous, unfair, and unhealthy. So, the manager needs to act as a team player and with flexibility. Who can substitute for the sick employee? How do you solve this problem? If your communication with the employee is effective, you have a good idea of what your sick employee planned to present. And, if you have to walk into the meeting and present when you’re not fully prepared? That will involve the application of your best soft skills. The presentation is going to take creative thinking and a display of confidence on your part. Whew! Using management soft skills effectively can sound like an impossible dream. But, it’s not. These soft skills are simply critical skills for all managers to work on regularly. You should not limit a manager’s annual goals to issues that involve straight productivity (how many widgets did you produce?) and profitability (how much money did you make?). The annual goals should include goals and measurements that involve assessing and rewarding the development and application of these soft skills. It is one way to successfully provide management development for your managers. For example, if a manager isn’t a good communicator or struggles with flexibility, then providing training is a priority. While some people naturally have these soft skills, not everyone does, but with mentoring and coaching, everyone can improve their soft skills with commitment. A manager, though, will not know that she needs to improve if she doesn’t receive the proper feedback, coaching, and training. Your employees won’t know how they need to improve either if a manager can’t provide the necessary feedback. To provide effective feedback, the manager needs to have developed good soft skills. You can easily see the problems that can happen when people are promoted just because they're good at their job. If your manager lacks the soft skills necessary to become a successful manager who can effectively develop and motivate employees, you have created a problem. And then, if that unsuccessful manager hires another manager to work with her, she’s not going to understand the importance of soft skills in a manager. So, she won’t screen potential candidates for their ability to apply the soft management skills on the job. That’s how you create an even bigger problem. It is how companies can end up with a whole company of bad managers. Hard skills are great, but for managers, the soft skills are the most critical part of their success. Make sure that you’re screening, coaching, mentoring, and training for these crucial soft skills. 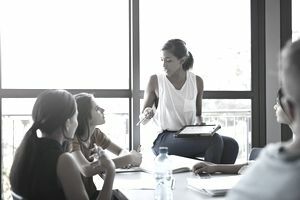 Good managers who effectively practice soft skills create an environment that is conducive to better and more productive employees, and that’s any successful business's goal.